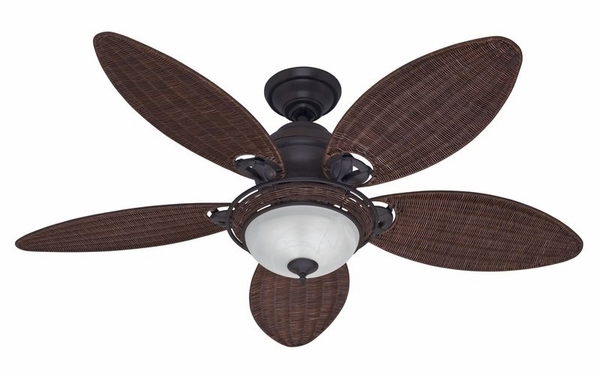 Hunter 54095 Caribbean Breeze Ceiling Fan with Blades and Light Kit - 54"
Home > Home Improvement > Fans > All Ceiling Fans > Hunter 54095 Caribbean Breeze Ceiling Fan with Blades and Light Kit - 54"
Hunter's gorgeous Caribbean Breeze Ceiling Fan with Fan Blades and Light Kit is a 54 inch Ceiling Fan that comes in your choice of weathered bronze or textured white finishes. The Caribbean Breeze Fan from Hunter Fans will certainly add a fun tropical feel to any room, from bedrooms to living spaces. 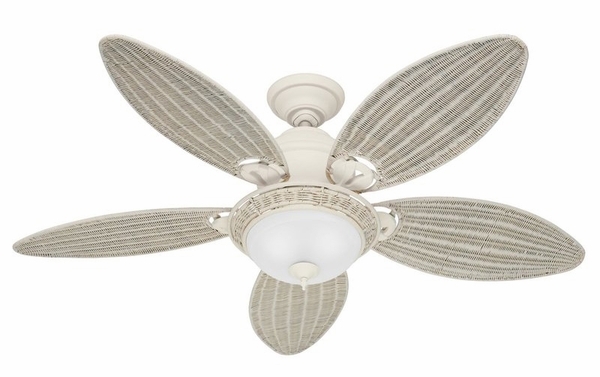 The five fan blades feature a beautiful antique dark wicker that complements the fan base splendidly. Installation is a breeze with the Caribbean Breeze due mostly to the fan's AVT hanging system. Cool down larger rooms that are up to 485 sq. feet in size, without making a peep. Hunter's Whisper Wind Motor is a powerhouse that runs quietly and efficiently.